Back in 2009 when the first Droid phone by Motorola was released, and in 2008 when the first 3G iPhone was put out onto the market, most of us scoffed. We assumed that this whole smartphone nonsense where you have to pay thirty extra dollars a month on top of your existing phone plan made no sense. Hell, most of us had just recently gotten phones with keyboards in them, which felt revolutionary to us. Although a majority of people thought the smartphone trend would never last (including myself), we were all wrong. Smartphones have dominated the telephone market for the better part of the last 5 years, and it seems like mostly everyone you see out in public has one of these high-tech internet connected phones. Most certainly not. Smartphones have changed the away our society works. Now, a world of information can be carried in your pocket and can update you on anything you want to hear about. Information is more and more readily available with new apps such as Facebook Paper, which allows users to see their Facebook feed and breaking news on the same timeline. This breaks the border between the news world and the social world and allows you to see only the news that you care about, which makes current events a lot more appealing. But this article isn’t about any cutting edge apps for these devices, it’s about the phones themselves. Due to the iPhone (well, the first one with mobile internet, the iPhone 3G) and the Droid (not the first HTC one, but the first popular Motorola model) being released around the same time, competition was imminent. And that’s a good thing. When two or more large companies are after the same market, they are constantly bettering their products in order to outsell the other, giving us, the consumers a better product and better deals when sales occur. And to this day, Androids and iPhones dominate the smartphone market. Although Windows phones are also in the running, this article is not about them, and I apologize in advance if I offend any Windows phone users by not including them. 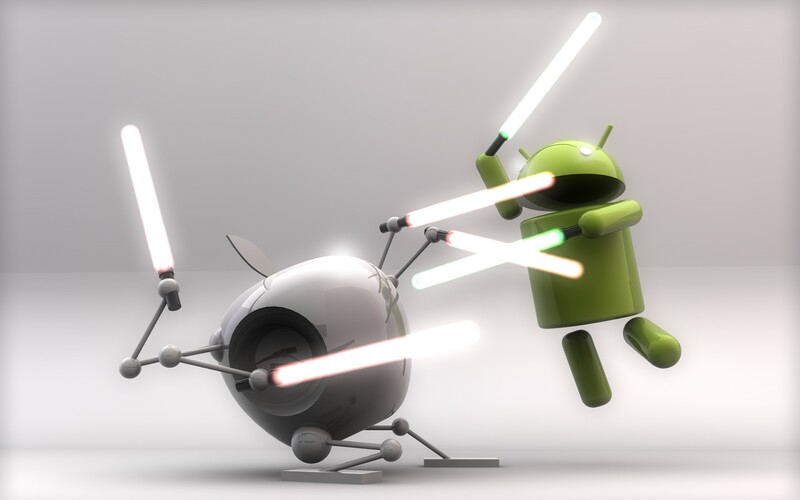 Regardless, these two types of devices have been going at it for years, constantly trying to outsell the other. It’s amazing to me that one company working on one phone (Apple/iPhone) can still manage to outsell many multi-billion dollar manufacturers who work to make the best possible Android phone. When it comes down to it, the buyer wants what they want, and they will buy whatever their preference is, even if the phone they are passing up has better features. Which is fine, because you should always use what you are comfortable with, not what the market tells you to buy. Smartphones have come a long way, too. For example, the iPhone 3G could only browse the web for 5 hours on a good day without dying, while the newest iPhone generation boasts 10 hours minimum of constant web browsing in order to wear the battery down. This being said, minor features and small technological advances that we “cannot live without” are the major selling points of smartphones. But where is the market going to go? It seems as if us “flat-thinkers”, people who can only see the here and now and cannot really look into the future, see this generation of smartphones as the best. I mean, what could get better than having a phone that is smarter than you? They couldn’t possibly get any better….right? That’s most likely what people thought about other technological advances that we have long surpassed since. So, you ask yourself in a non-rhetorical way, how could smartphones get better? Well, let me put forward a few ideas that I have of what the future may hold. Why hasn’t this been done yet? The technology is there and it is old enough that it can be done for a relatively cheap price. So why not include a solar charging panel on the back of the phone to lay out in those hot sunny days, but also include a charging port in the phone if it is overcast for a normal cord. Imagine Siri. Now imagine Siri without having to speak. When a button is pushed, the phone would tune into your thought channel and do whatever you pleased in a matter of milliseconds. Obviously this would involve organic surgery and the technology most likely isn’t there yet, but we can dream, can’t we? I’ve seen concept art for this, but never an execution. Typing long paragraphs on your phone is annoying. What if the phone had a built in projector that flashed a keyboard onto any surface in order to type with ease and grace? Either way, I’ll probably still end up typing with just two fingers. This is an obvious one, but come on. I have to charge my phone at least once during the day to make it last until night. JUST UP THE BATTERY CAPACITY ALREADY. If you’re like me and have tried to take a Snapchat or a selfie in the dark, you’ll be much to your dismay when you realize that the picture shows up dark. Companies should implement a front facing flash for the front camera in order for people to rev up their “selfie game”. These are just a few ideas. Many more things can happen in the market of phones, because there are so many possibilities. I doubt any of my predictions will come true, but if they do, you can say you heard it here first. Or, if you heard it somewhere else first, you could lie and said I made it up. Whatever you feel like. All joking aside, I am very eager to see what the smartphone market has to offer and I will be anxiously awaiting the next generation of iPhones and Androids. If you have any neat ideas regarding advancements in smartphone technology, feel free to post a comment on my blog, goldenanchurs.wordpress.com. Thank you for taking the time to read this, and I hope you use your phone in good health. P.S. : I did an interview with Phil on my blog regarding Save State Gamer, and it might be worth checking out if you’re missing Phil’s posts while he’s gone! I’d like to see a “landline ringer” on the phone. Landlines had to ring loudly, so you could hear them across the house, and not miss your phone calls. While I understand that a ringer that loud doesn’t work on a cell phone (too loud if it’s in your pocket, or when you’re in public), I miss an awful lot of texts and calls that come in when my stupid phone is in the other room, and my loudest ring setting isn’t loud enough to reach me. I guess that’s not a smartphone thing per se, but adding in a feature like that might save a lot of headaches from developing. Yes, my grandfather had this same problem because he is hard of hearing. If you search “loud ringtones”, you can get some pretty loud ones that may suffice. I hate to say it, but I find this piece to be short-sighted, and I don’t say that to degrade the author. The smartphone market is an evolution of the cell phone market, but it has also disrupted the gaming industry and the consumer PC market, as well. Android isn’t a smartphone, it’s an Operating System – an OS that has now become an open-source haven for independent development across smartphone, tablet, netbook, laptop and numerous other “smart” devices in today’s electronics industry. iOS is Apple’s alternative and it’s these two OS’s that are what drive the innovation and evolution of smartphones. Looking forward, we are going to see these two OS’s continue to get larger, more accessible and of course, more powerful. This will continue to make the relevance of home computers diminish and our smartphones will continue to do new things. In my home, we use our iPhone 5’s to stream video, music and images to our TV, via Apple TV, as well as our iPad’s. Everything is linked together from one account and accessible from anywhere in the world that has in Internet connection, just as the Android market offers today. The fact that these OS’s will continue to grow and become accessible to more devices means that this market is going to do nothing but thrive. Once device manufacturers start to build these smart devices around having the ability to access a HD/docking station for “externally powered” use, it will change everything. Do you know why we can’t play high-end PC games on smart-devices right now? The device isn’t designed around being externally powered for high-end use. Once they are, it’s is going to be awesome! Thanks for the reply, and I’ll reiterate that I meant no offense toward you in any way. I’m very much a forward-thinking type of person and I do follow the industry trends quite extensively. I’m also an open-source fanatic, so I, of course, supported Ouya in its Kickstarter campaign. I also did take note that you angled this piece directly towards the “phones” themselves too. The progression of these devices excites me to no end. People come to my home and see how we’ve integrated our smart-devices together and oftentimes can’t believe (and didn’t even know) they could perform these functionalities. I also see the potential of these devices eating into an ever-larger market share of the traditional gaming consoles being a very high plausability. When we can dock these devices into a power source that has an external HD and HDMI outputs, and the devices (and the OS) are designed to function at their peak levels when doing so, there high potential that we will be sitting on our couches playing the then current generation video games with a controller in hand, through these devices. It’s entirely possible and so many in the industry are looking to that right now. I completely overlooked the gaming aspect of phones in this article, but you’re right. If you look at games like Infinity Blade or Dead Trigger, you can see the true capabilities of what our phones can really do, and how quickly our graphics and RAM can progress in such tiny devices. It’s truly amazing. See, I think that Infinity Blade shows what these “devices” can do as portable devices. In truth, these games are too limited to be comparable to PC titles, but work very well under the devices limitations. What I’m referring to, is when these devices are getting simultanous releases of the major titles like FIFA, Battlefield, etc.. This most likely won’t happen until the devices use a docking station for home console-like play, but – what’s stopping them from doing so? Imagine a world where your phone is at once a Playstation/XBox/your preference of console, a PC, a phone (gasp!) and portal to the world networks, and is then connected (hopefully wirelessly) to something like the Google Glass technology. Once it becomes an overlay, a HUD to your own life, it will be everywhere and simply become part of you. Surely this is, ultimately, where it will be headed. Cloud data storage and huge capacity batteries, wireless (effortless) connectivity between different machines and the processing power to handle whatever tasks we can throw at it (which will come as we use different materials for motherboards, etc) will make it as ubiquitous as any piece of technology in the world today, if not moreso. “Everyone” has a PC. “Everyone” has a TV. “Everyone” has a mobile/cell phone. But after a couple of generations, everyone, literally, will have an Occulus Rift/Google Glass/whatever becomes the popular and efficient option mounted to their face (if not implanted into their eyes). Science fiction. But so were the datapads and touchscreen computers from Star Trek: TNG. And they look a lot like iPads to me. Yeah, the real life HUD really does sound like the way of the future. I personally can’t wait for the next step in technology! Thanks for the comment! Also, LOVE that banner picture! If that had been the end of Revenge of the Sith, I might have liked it more. Thanks for the article. Real thought provoker. I’m glad you liked it! I have more posts on my blog, goldenanchurs.wordpress.com! Hopefully they can provoke some thoughts too. Thanks for the comment! Articles like this, and I don’t mean this as offence, but they really make me wonder if I’m the last sane person on Earth. I have a Blackberry and the battery and data usage are great, and it’s great browsing the web or watching videos or whatever. Meanwhile, it seems like everyone I know is buying whatever the latest Samsung phone is, seeing their data usage quintuple while the battery lasts maybe four hours. All so they can use some gimmicky apps a couple times. I really do not understand it. But I have come to grips with the fact that I am in the vast minority. At least for now.